The BCaD post for 5th December 2017 quoted from Proverbs 10:1 which speaks about a wise son bringing joy to his father while a foolish son brings grief to his mother. It’s first of all worth noting the context in which these words were written where there was much more emphasis on the male child – there are no comparable references to daughters in the book of Proverbs at all. (There are other references to fathers and mothers which add additional insight to this such as Proverbs 20:20, 23:22, 23:25, 28:24, 30:11, 30:17). 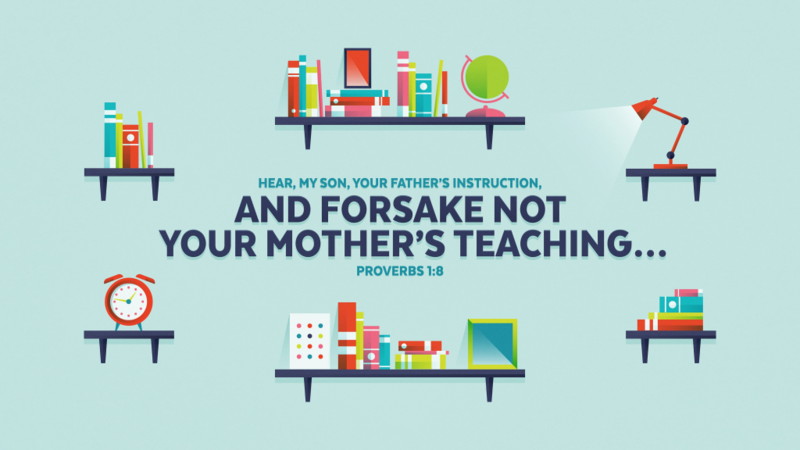 The contrast between Proverbs 10:1 and Proverbs 17:25 suggests that the actual distinction in terms of negative responses are not great but it is interesting that, overall, we see positive attributes (wisdom) being appreciated by his father while negative attributes (foolishness) affecting both parents. ḥākām “wise” and kesîl “fool” are common antithetic word pairs, and the phrase “father and mother” is a common broken, stereotyped phrase designating “parents” (1:8; 4:3; passim). Bruce K. Waltke, The Book of Proverbs, Chapters 1–15, The New International Commentary on the Old Testament (Grand Rapids, MI: Wm. B. Eerdmans Publishing Co., 2004), 42–43. The effect of the ‘wise son’ is that he makes his father ‘glad.’ The word describes a joy that affects the whole of a person: heart (Exod. 4:14; Ps. 19:8; 104:15), soul (Ps. 86:4), and eyes (Prov. 15:30).3 The effect of the ‘foolish son’ is that he brings his mother ‘grief.’ Such a son brings much hardship upon his parents (Prov. 17:21, 25; 19:13). Indeed, he not only hurts them; he personally ‘despises’ them (Prov. 15:20)! The father and mother are mentioned separately, not because one is more susceptible to hurt and the other more prone toward joy, but as a literary device to indicate that the whole of the family shares in the follies and triumphs of other family members. No child can avoid bringing either joy or pain to his parent’s lives (Prov. 17:21, 25; 23:24–25; 28:7; 29:3). While an age of greater independence is desired by all, one never outgrows one’s responsibility to, or effect upon, one’s family. What capacity for pain we take on when we hold our first child in our arms! But, oh, how our opportunities for joys untold are expanded at the same time! John A. Kitchen, Proverbs: A Mentor Commentary, Mentor Commentaries (Fearn, Ross-shire, Great Britain: Mentor, 2006), 214. And these observations are consistent with what we see in the other references to the impact sons have on their parents. So – on balance – I don’t think we should read too much into the distinctions but see them as speaking about different ways the behaviour of a son (and we can legitimately extend this to daughter) have on their parents. In a world where the long-term well being of parents was dependent on their children to care for them in later life – and with this responsibility primarily going to the eldest son – this was really important. As parents saw their son develop and grow so they would get an indication of how he would be able to take on the family business, how well he would care for them in later life. With the many variations in family structures and social care provision we have in our culture today some of the ways in which this is worked out will vary – but it does encourage us to think about how our behaviour and attitudes are seen by our parents and what this says about how they will receive the care they need in later life. Primarily it’s speaking about children and parents but it is good to recognise that how we are and how we behave can have positive and negative impacts on all those with whom we come into contact and, particularly, for those for whom we have some level of responsibility.